LEGAZPI -- Lava fountaining regularly from the Philippines' most active volcano has flowed up to 3 kilometers (1.86 miles) from the crater in a dazzling but increasingly dangerous eruption. Mount Mayon was spewing lava up to 600 meters (2,000 feet) high and its ash plumes stretched up to five kilometers (3 miles) above the crater. 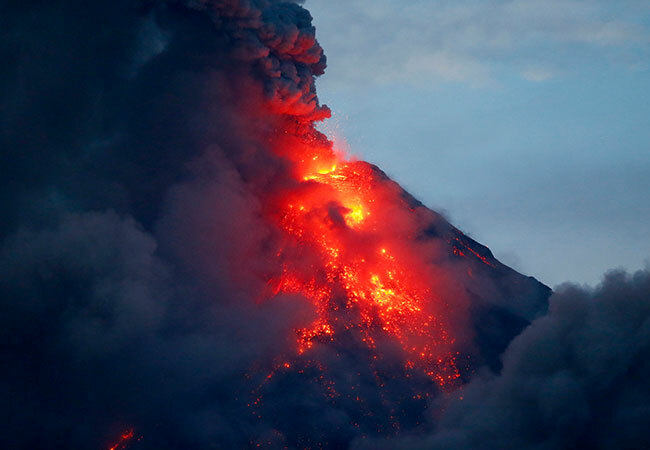 The Philippine Institute of Volcanology and Seismology said Wednesday morning two of the lava flows had advanced more than a kilometer (.6 miles) and pyroclastic flows — superheated gas and volcanic debris — had reached 5 kilometers (3 miles) from the crater in one area.